I don't have a great deal to say about Juan Beniquez. He was a serviceable utility player who I remember best for being the guy set to platoon at DH with Rick Leach when Jimy Williams changed his mind and let George Bell play the outfield. 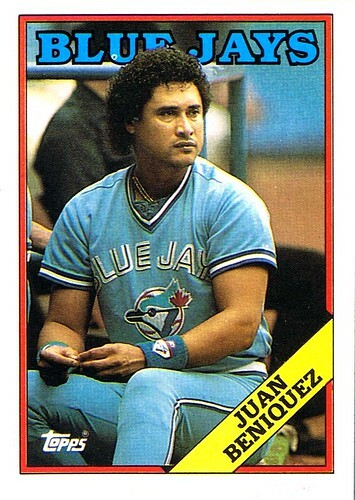 Does anyone remember the rookie who was supposed to start in left field when George Bell was moved to DH in '88? It was Sil Campusano who retired with a .202 batting average, 5 home runs and 23 RBIs. Hey Jimy, if you're going to piss off the AL MVP, make sure it's to promote someone who will manage more than a couple of dozen rbis in his career. actually kind of looked like George Bell's twin.